Create the right ambience and setting for a retreat center with the work of a professional interior designer. Jaan Ferree is experienced in designing outdoor spaces such as labyrinths and meditation gardens, and she is adept at designing indoor sacred space, as well. Set the tone for a relaxing, enlightening retreat with a professional interior design conceived and implemented with the right intention. Ask Jaan Ferree about implementing feng shui interior design to improve productivity and income from the retreat center. With vision, intention and implementation you can enhance the rate of relaxation or energize the space for creativity for the people who come to the retreat center. By using sustainable materials you honor the values of many of your clients. By harmonizing with the surroundings and balancing the elements within the space you create a more pleasant and inspiring environment for your clients. Jaan Ferree design labyrinths for public spaces both indoors or outdoors. Recently she's been commissioned by Mission Hospitals, Inc. in Asheville North Carolina to design a labyrinth inside Saint Joseph's Chapel. Jaan works closely with healthcare administrators and chaplains to design a labyrinth to be explored by all hospital visitors and staff that want to take a prayer walk, or sit in silent reflection nearby the labyrinth. In close consultation with the health care professionals in Mission Hospitals, Inc., Jaan determines the size of the labyrinth, placement in the interior, and materials to be used to construct it. Outside the labyrinth, extra space is included to protect the interior from interference. The exterior of the labyrinth has an ambience geared towards comfort and peace and may include plants, soft lighting, music, or a place to sit. Through public installations of labyrinths in health care settings, Jaan intentionally creates a sacred space for prayer. This quiet sanctuary is needed within a healthcare environment where human needs, emotions and pain are sometimes overwhelming. 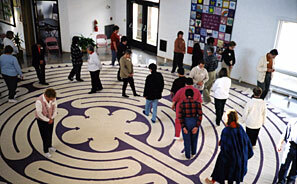 Staff, visitors, and patients may visit the labyrinth and feel renewed. There is only one path out of the labyrinth. It is a silent prayer walk. The same path that takes someone to the center will take the visitor out again. There is no right way or wrong way to walk the labyrinth. Jaan Ferree is happy to conduct prayer walks with groups. Jaan begins by introducing the group to the labyrinth and the space. She offers the opportunity for the group to ask questions before the Prayer Walk. When the labyrinth walk is about to start, Jaan stands at the entrance to the labyrinth as a 'non-anxious' presence. Each person takes the prayer walk at his or her own pace. Afterwards people can observe others walking, sit in silence, write in a journal or meditate. Jaan remains at the entrance until the last person has walked the labyrinth. After completion of the prayer walk, Jaan is available to listen to shared the experiences. Ferree has her own intuitive method of dowsing for an energized spot for an outdoor Labyrinth. Once the location is determined, the number of turns and circuits is intuited too, and the public labyrinth begins to take form in Ferree's mind. The community may take part in the labyrinth's construction. Or in the case in this photo, this horse oversaw the entire construction with an amazing degree of focused attention. 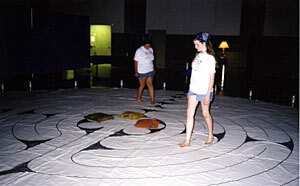 Many are invited to use the labyrinth as a form of togetherness, prayer, challenge and journey. 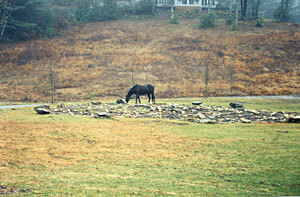 Jaan Ferree designed a Labyrinth at Davidson College for Davidson College's 2001 Horticultural Symposium "Artist in the Garden: The Interaction of Nature and Art"
"[Jaan Ferree] has conducted numerous Labyrinth Workshops here at Valle Crucis and in churches throughout Western North Carolina and Southern Virginia. She brings to these workshops an understanding of the history and power of Labyrinths, and she possesses extraordinary skill at setting the tone for spiritual discovery and awareness through the Labyrinth."